The Dark Star sculpture is Arlington’s first commissioned art piece. It was sculpted by famed artist Nancy Holt and installed in 1984. 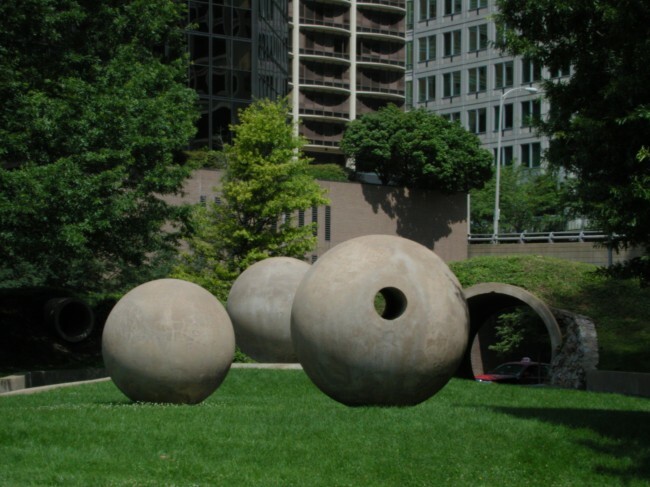 The sculpture consists of five spheres, two pools, four steel poles, a stairway, a large tunnel for passage and a small tunnel for viewing and plantings. Every year on August 1 at 9:30 a.m., visitors arrive at the 0.4 acre park to witness the coming together of shadows. The park’s large spheres are designed to resemble fallen, extinguished stars. One section of the park contains spheres and poles with shadow-images inset in the ground. There is also a water feature for your enjoyment.